As a result of the schedule adjustment, she is now expected to remain in orbit until February 2020, when she returns in a Soyuz spacecraft with NASA astronaut Luca Parmitano and Roscosmos cosmonaut Alexander Skvortsov. Whatever it's called, Koch's stay in space should be long enough for NASA to collect additional data about the threats of long-duration flights on astronaut health and performance. An exhaustive study of Kelly and his twin Mark, who remained on Earth, raised some troubling concerns about DNA damage and cognitive decline during the long-term flight. 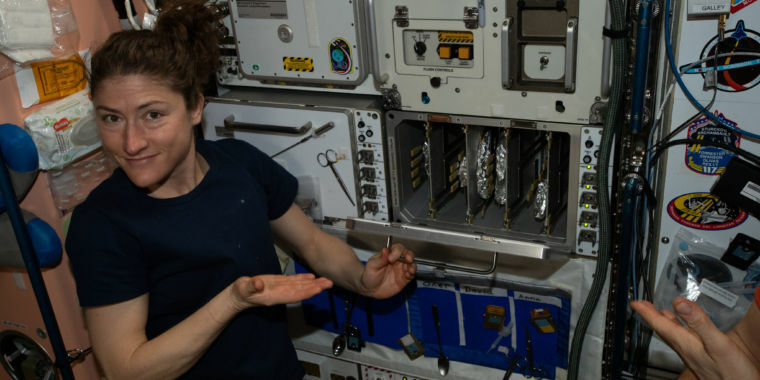 With a third and fourth US mission extending beyond 250 days, NASA scientists have said they hope to better understand these threats and how the human body can adapt and respond to the challenges of microgravity. These concerns have led some spaceflight experts to say NASA should find better or faster ways to send humans to Mars, instead of the current six- to nine-month trip using existing technology. A faster trip would mean less time in space, exposed to weightlessness and deep-space radiation, and healthier astronauts both for their exploration activities, and later in life after they return to Earth.